This beautiful book of 9.5 x 1.8 x 12.5 inches is a first-of-its-kind book on the process of casting that shows how prevalent and important this art form is in our lives. A fascinating read for anyone who loves art and learning new things. Reading this book brought back a cherished memory. When I was a little girl, my mother had my baby leather shoes cast in bronze, which she then displayed on the dresser in her bedroom. One of the shoes (white moccasin-like Italian-made) had become unsewn in the front and my mom had wanted to resew it before the casting, only to be told that it would be more original to leave it as it was. She did. Those baby shoes are still displayed on my parents' dresser, and it made me appreciate art made from everyday objects. When I first learned of this book CAST, I was interested because I have an appreciation for art instilled in me by my parents, especially on my trips to Italy. I was not disappointed. This book is a true treasure. And it made for some fascinating reading, educating me further in the art of casting, which unfortunately has gotten a bad reputation because of the saturation of mass production since the Industrial Revolution. It's clear the authors (both renowned craftpeople) have a love and passion for this art form and have produced a book that goes into detail, not only about the process, but its history and impact as well as its role in metalwork, ceramics, glasswork, jewelry and many other materials. This beautiful book of 9.5 x 1.8 x 12.5 inches is a first-of-its-kind book on the process of casting that shows how prevalent and important this art form is in our lives. 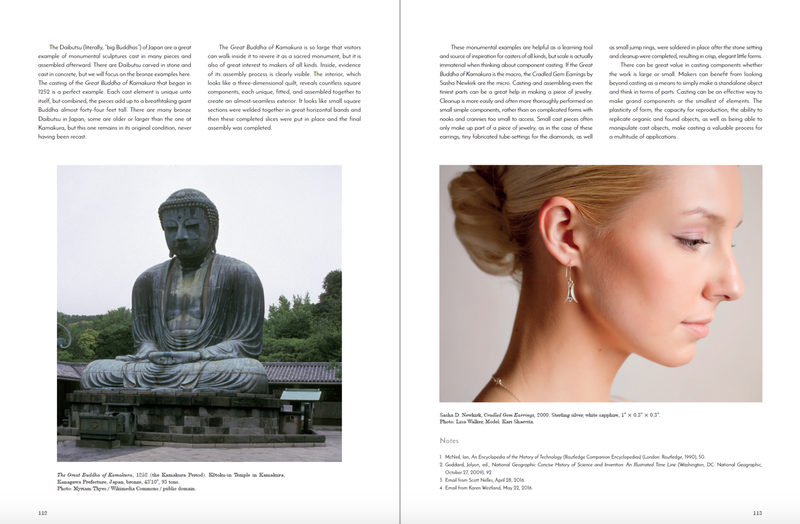 It includes stunning photography on almost every page, 800 photos in all to be exact. So although the font is small, the book layout invites one to read its content. I especially enjoyed the history section, and the ones on glass and jewelry. The book also introduces us to 17 casting artists. Some of the art pieces in this book are amazing, original and creative. Others I didn't care for, but that's art. What one person thinks is amazing another may think is hideous. The point is that man has a wonderful imagination for art and for making objects to simplify and contribute to our daily life, such as the toilet bowl! Yep, it's part of the casting process. The book contains a glossary, bibliography and index at the back of the book, making this an excellent reference book. 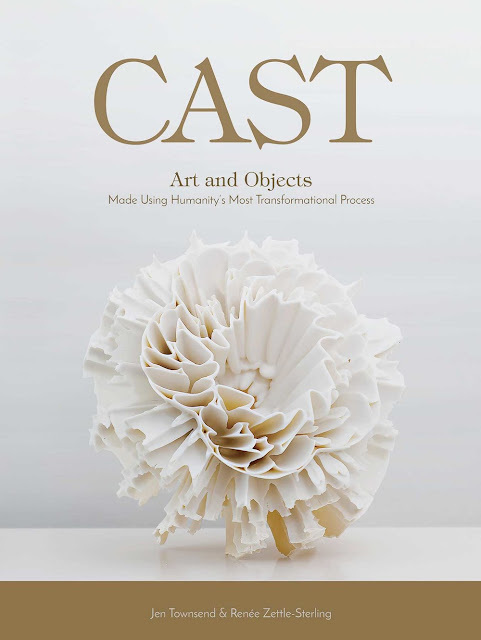 CAST is a beautiful coffee-table book that can grace a living room and would be very useful in a library for artists, historians, and anyone who loves learning new things. 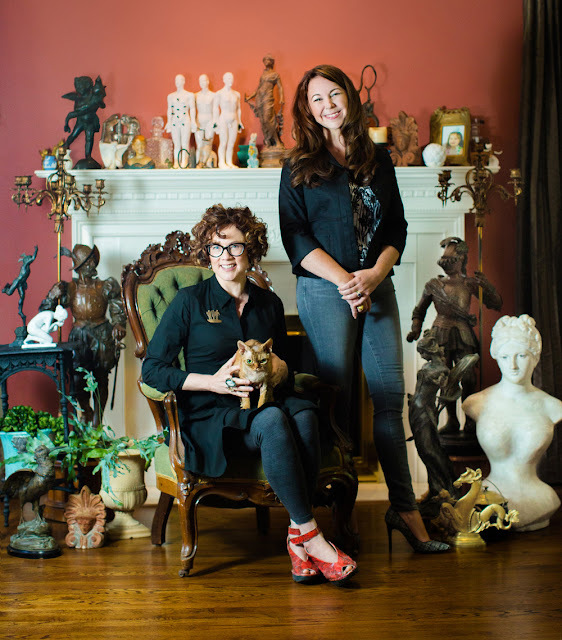 Jen Townsend and Renée Zettle-Sterling are metalsmiths, authors, and teachers with an insatiable passion for casting of all varieties. TOWNSEND has been making jewelry since she was 13 years old. She earned an MFA in Jewelry and Metalsmithing from Southern Illinois University Carbondale, where she studied under Richard Mawdsley. For fifteen years, she has run a successful jewelry studio, focusing on bespoke pieces for clients. She has taught throughout the United States, including Millersville University, the metal studio at Dartmouth College, the Penland School of Crafts, and the Mendocino Art Center, among others. In addition, Jen's work can be seen in Metalsmith Magazine, Showcase: 500 Art Necklaces, and in Art Jewelry Today 2. Her work has been shown at The Orkney Museum in Scotland, Shanghai Design Week, and her work is in the permanent collection of the Imperial War Museum in London. ZETTLE-STERLING always knew she wanted to be an artist. She was introduced to casting in high school at the prestigious Governor’s School for the Arts and Carnegie Mellon’s Pre-College Summer Art Program. She studied fibers and papermaking at Indiana University, where she cast using paper pulp, but her real passion for casting was ignited in graduate school. She earned an MFA in sculpture/installation and an MA and jewelry/metalsmithing at the Edinboro University of Pennsylvania. In her studio practice, she casts and fabricates in a wide range of materials. She has exhibited and curated both nationally and internationally, including exhibitions in Tokyo, New York, and Art Prize in her local community of Grand Rapids. In service to her field, Renée served as President of the Society of North American Goldsmiths. She is also a tenured professor at Grand Valley State University where she has taught for seventeen years. Find more on the book at www.castartandobjects.com. Follow the project at on Facebook and Instagram. Just the kind of book I love paging through. Thanks for sharing about it!